If your into fixing things around your home, then a tool that’s a must is a table saw, and I will give you a review of some of the best table saws of 2019. After installing new windows then you will find that with most of them you will need to finish them off on the inside, and a table saw is perfect to cut some pine, cedar or what ever type of wood you wish to go with down to the widths you will need. 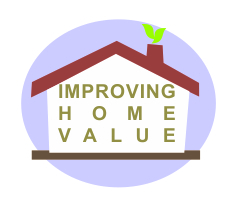 There are many other projects you can use it for around the home, or even on a construction site. Most portable table saws today are made of aluminum, or other lightweight materials, so are very easy to move around, and you can also buy the table saw stands with wheels to make life even easier. One of the first table saws that I owned was from about twenty years ago, and was made of cast iron and steel with a large motor on it, and would weigh about 300 pounds or more, so was not easy to move around, unlike todays modern table saws. Below is a review of some of the better table saws on the market today, so if you are interested in buying one, then have a read. This is a 15 amp 10 inch table saw that will give you 4 HP maximum, and 3600 RPM will give you a very clean cut for your wood projects. The motor has a slow start, but will maintain a constant speed when cutting, and features a 5/8 inch arbour for compatible blades, also for keeping the saw at a lightweight it is made of aluminum giving it a tough durability and a long life. The table is 29 by 21.5 inches, so you can easily cut anything up to 25 inches wide, or even wider if you want to add some stands to the side of the saw. The Squarelock rip fence is one of the best that is engineered for maximum accuracy with every cut, and it locks in place for a very precise measurement to the blade. A Smart Guard System on this saw gives good visibility when cutting, and protects the user. It has a built in riving knife, blade guard, and anti kickback pawls, and will require no tools to install on the saw. Bosch also makes a Gravity-Rise table saw stand, the TS 3000 with pneumatic wheels for this saw, and with both saw and stand it will weigh about a 100 pounds. This stand can also be adapted for other brands of saws to fit it. This is another excellent lightweight table saw, and weighing only 45 pounds will be very easy to move around. It has a 15 amp motor, and cuts at 4500 RPM, so will even cut through hardwoods, and has a dust collection port at 21/4 inches so that a shop vac can be connected to it to keep the dust down. This 10 inch compact saw features a rack and pinion telescoping fence rail to let you make fast adjustments for your cuts. The table will let you cut up to 241/2 inches, and for bevel cuts it will adjust from 0 to 45 degrees. It has two small feet at the back of the saw that are adjustable for keeping your saw at a level, and it also has places so you can keep your push stick and parts for the Site Pro Guard system attached to the saw. The 10-inch blade on this saw is carbide tipped, and will cut to a depth of 31/8 inches at 90 degrees while the 45 degree cut will go to a depth of 21/4 inches. Dewalt also has a mobile stand for this table saw which is easy to set up and take down providing excellent stability when cutting. Makitas table saws are some of the best you can buy, and the only difference between the model 2705×1 and 2705 is that the x1 comes with a stand. This model was made for professional contractors, but that only means that it would work great also around the home, and being quality built you know it will last. 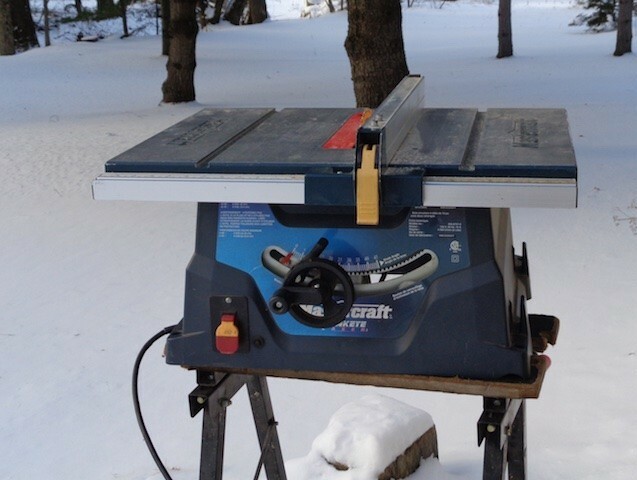 The table is 24×22 inches, and with the rails extended you can cut up to 25 inches, and with a weight of 82 pounds this saw is easy to move around. 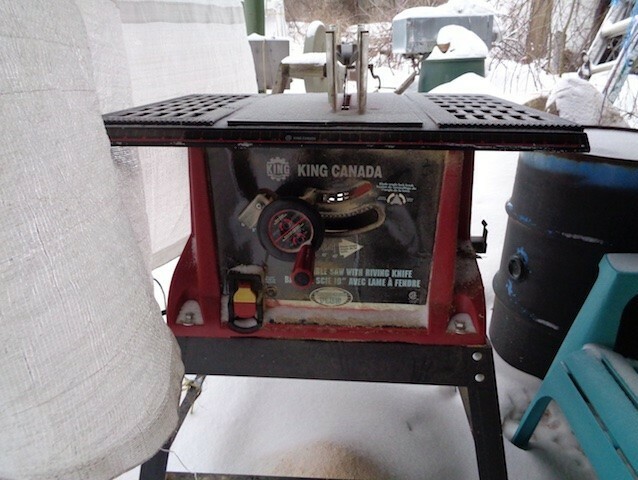 With a 15 amp motor, and turning at 4800 RPM it is one of the best in its class for power, and has an electric brake for a safety feature which can stop the motor in less then a second, plus the off on switch on this saw is large enough to work if your wearing gloves, or you can even hit it with your knee. It also has the three-piece modular safety system with the riving knife, anti kickback pawls, and the blade guard which is very easy to move ans set up. The saw will cut 3 5/8 inches deep at 90 degrees, and 2 1/2 inches at 45 degrees with its 10-inch carbide tipped blade. As table saws go this is one of the best, and of an excellent quality to make it a high performance tool to have for your tool collection. This saw I have used for the past 4 or 5 years with almost zero problems. After quite a bit of use the crank handle would not raise the blade, but it would go down very easy. In order to cure this problem give it a good cleaning, and an air compressor works well for this, then spray some graphite on the screw rods and thrust washers, and it should be cured. It is not recommended using a wet lubricant on this as the sawdust will stick to it. 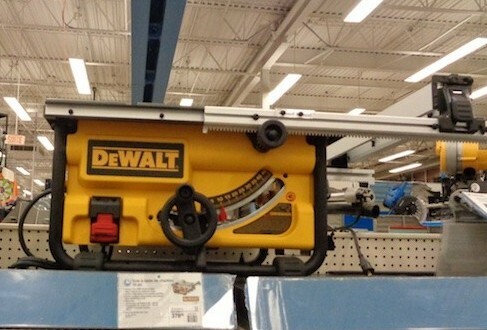 This saw has a table size of 26×19 11/16 inches with extensions on the sides for wider cuts. It has a 15 amp motor and spins at 4500 RPM with no load, and come with a 10-inch carbide tipped blade, some tools for blade changing, and a sturdy plastic push stick that can be stored on the side of the saw. This saw was very easy to set up with the blade running perfectly true to the table, as I have heard that one of the newer models has a defect for adjusting the blade, so be careful when buying-check the blade. It will cut 3 9/16 inches at 90 degrees and 2 5/32 at 45 degrees, and with this saw weighing 65 pounds it is easy to move around, and comes with a stand also but no wheels on it. This is a very good saw for around the home, and even some construction work. This saw comes with a 15 amp motor, and a no load speed of 4800 RPM, and has a Maximum cut at 90 degrees of 3 9/16 inches, ad 2 9/16 inches at 45 degrees. It has a sliding extension for the table on the left side to allow for a 36-inch cut, and comes with a laser guide, rip fence, miter gauge, push stick, riving knife, dust bag, and two blade wrenches. There is a stand included that has wheels, and is able to be folded for moving around. The saw weighs about 88 pounds so should be good for those home jobs or construction work. It claims to have the most cutting depth of any saw, but then my older Mastercraft has the same depth of cut, so always do your homework before buying. The laser guide on this saw will adjust for when the blade is tilted for angle cuts, but from my own experience I find a laser guide on a table saw- unless often cleaned- will get coated in dust, and then becomes hard to see as I took the one on my saw off. One other thing when buying a table saw always check to see if the blade is running true to the table, or if there is an easy adjustment for setting it up correct. This is a 10-inch portable table saw with worm drive, and the table is able to give you cuts up to 25 inches in width. It has a 15 amp dual field 5HP motor, which won’t heat up with any heavy cutting, and has a worm drive gearing for extra torque and power spinning up to 5300 RPM, so will not quit when cutting thick or dense material. The saw will cut 3 1/2 inch material at 90 degrees, and the bevel cuts can be made from 1 degree to 45 degrees. It comes with a 10 inch 24 tooth carbide tipped blade, miter gauge, self aligning fence, guard system, anti kick back, push stick, and wrenches for the blade changes. This saw does not come with a folding stand, so it will have to be bought separately, but with the saw only weighing 49 pounds is very easy to move around. This saw is powered by a 15 AMP motor with a soft start function, and an electric brake for safety, plus it will turn at 4500 RPM. The table is 28 3/4 inches by 22 inches, and can be extended to 35 inches on the right of the saw for wider cuts, and comes with the riving knife, and anti kick back pawls to make things a little safer. On this saw the miter gauge has convenient marks of 0, 15, 30, 45, and 60 degrees on both sides of the blade, and for bevel cuts it is 0 to 45 degrees, with a cutting depth of 3 1/8 inches at 90 degrees, and 2 1/4 inches at 45 degrees. It also comes with a folding saw stand that has 8 inch rubber threaded wheels, and you will notice that the legs of the stand have a wider spread for more stability when cutting, and with a total weight of 96 pounds it can be loaded into your truck by yourself. The fence is of a rack and pinion design, so is adjusted with a knob on the side, and also comes with a 40 tooth carbide tipped blade, and a dust port for attaching a vacuum for the sawdust. Also, on this saw you might first have to adjust the blade so it runs perfectly parallel with the miter slots on the table, and you will have to remove a pair of bolts under the table to do this, which was not mentioned in the Manuel for this saw. This saw has a 15 AMP motor to spin the blade up to 4400 RPM. It will cut 3 1/2 inches at 90 degrees and 2 1/4 inches at 45 degrees, and the table can give you a cut of 25 inches. This is more of a heavy-duty saw for construction work or around the home, and weighs about 95 pounds but comes with a folding stand with wheels for moving it around. The fence on this saw is of very sturdy quality, and works smoothly on the table with a lever that locks it in place. It comes with a tape measure for figuring the fence distance from the blade, which does not look like it would last too long, but if your like most people using a table saw, then just measuring from the fence to the blade usually works the best. The saw has a place to store the tools, and replacement blades on the side of it, and the miter gauge with this one works very well. The gravity stand for this saw is very convenient to fold and unfold, just by pushing the locking lever, and the handle of this stand is at the right height to support larger cutting materials, so will be a good table saw for around the home or for what ever else you won’t to use it for, plus it has a place to hook up the vacuum for sawdust collection. This 10 inch 15 amp table saw is not very expensive for anyone on a budget that needs work done around the home, and it can do a variety of cuts with ease. The 15 amp motor will run the blade up to 4800 RPM for smooth cuts, and the table is 24 inches by 20 inches made from aluminum. Its miter gauge is larger then most for accurate cuts from 0 to 5 degrees, and the fence is self aligning, and locks up from the front and rear on the table. The saw weighs about 56 pounds, and comes with a stand but no wheels on it for moving around, and it also has a 2-year warranty. There is a place on the saw for storing the push stick, miter gauge, and a blade holder. The 10-inch blade is 40 tooth carbided tipped for sawing just about anything, and has the tools for changing it. For the price you pay, this is actually an excellent table saw for around the home. This saw has a 15 AMP heavy-duty motor that will turn up to 4400 RPM, with a table that is 30 x 21 inches aluminum cast, and comes with a folding stand with 8 inch wheels for easy moving. There is a storage on the saw to secure the rip fence, miter gauge, extra blade, push stick, and wrenches when moving it from one place to another. 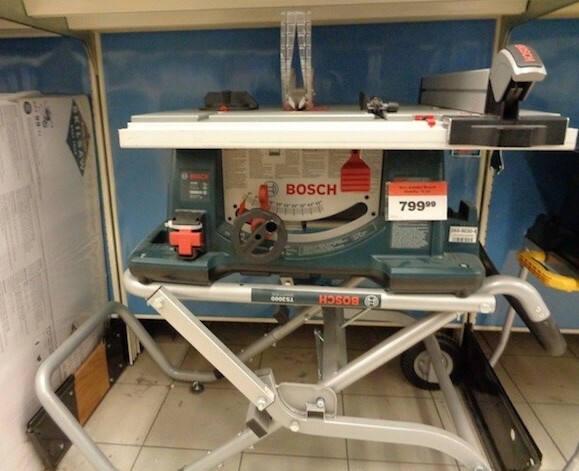 This is not too expensive a table saw to try out for cutting around the home. This saw has a 15 Amp motor, and a no load speed of 5000 RPM. With a 10-inch blade that is 28 tooth carbide tipped it has a maximum cutting depth at 90 degrees of 3 1/2 inches, and 2 1/2 inches at 45 degrees. The table is 26 inches by 19 1/2 inches, and you have a 30-inch cutting capacity on the saws right side of the blade. It weighs about 68 pounds and comes with a folding stand on wheels for easy moving from place to place. Like many of the new saws it has a storage for the rip fence, miter gauge, and blade guard assembly, push stick, and extra blade on the side of this saw. The dust chute is 2 1/2 inches so you will need an adapter down to 1 1/2 inches for some of the shop vacuums. When setting up the fence, you will notice that it locks on both sides of the table, and might need a little adjusting. For the price this is a good saw to use around the home for the DIY. When your out looking for a table saw, try to find one that meets what you want to use it for, and within your budget. Table saws come priced from $150 to a thousand plus for the higher quality saws. Another thing that should be mentioned is to always keep the safety factors on these saws working well, because 5 fingers is way better then just 4, so be careful using a table saw. Some of these saws have a lock mechanism on the switch to prevent any accidental start-ups if you have children around, or even some adults, so always cut with safety on your mind. There are other brands of table saws that I have not mentioned here, but have reviewed most of the better known brands, so always do your homework before buying one. I hope this gives you a few ideas on your next purchase of a table saw to meet your needs. Any comments, just leave a message.